What is a Course Bundle? A CCO Course Bundle is a collection of courses that are typically required to pursue a specific career in the medical industry. The Courses have all been pre-recorded and provide core competencies on the topics it focuses on. Depending on which credential you are planning on testing for and what areas you need to focus on we are sure to have a package to meet your needs. Our Course Bundles also include their respective Review Blitzes which are suitable for reviewing, refreshing and refining multiple skills or competencies. They are normally recommended after a Course in order to provide the essential knowledge required for the corresponding exams without any “fluff” or filler. To find out more about what each Course covers click on the individual links below but remember, you must return to this page to get your discounted bundle price. This is exactly what you need to start a lifelong career as a medical coder and/or medical biller in the next year. We include courses for both career paths. You will receive 9 12 months of access to the Physician Based Medical Coding Course (PBC), Physician Based Medical Billing Course (PBB) and the Medical Terminology & Anatomy Course (MTA). Plus, we also include free access to the AAPC's CPC® and CPB® Content. Also good for CCS-P and other physician based exams. If purchased separately, all of these Courses and bonuses normally cost $4,526. One payment today, the rest every 30 days. This is exactly what you need to start a lifelong career as a medical auditor in the next year. We include courses for this exact career path. You will receive 9 12 months of access to the Physician Based Medical Coding Course (PBC), Physician Based Medical Auditing Course (PBMA) and the Medical Terminology & Anatomy Course (MTA). Plus, we also include free access to the AAPC's CPC® and CPMA® Content. If purchased separately, all of these Courses and bonuses normally cost $4,075. This is exactly what you need to start a lifelong career as a Risk Adjustment coder in the next year. We include courses for this exact career path. You will receive 9 12 months of access to the Risk Adjustment Coding Course (RA), ICD-10-CM Full Course and the Medical Terminology & Anatomy Course (MTA). Plus, we also include free access to the AAPC's CRC® Content. If purchased separately, all of these Courses and bonuses normally cost $3,748. This is exactly what you need to start a lifelong career as a Risk Adjustment coder in the next year. We include courses for this exact career path. You will receive 9 12 months of access to the Risk Adjustment Coding Course (RA) and ICD-10-CM Full Course. Plus, we also include free access to the AAPC's CRC® Content. If purchased separately, all of these Courses and bonuses normally cost $3,609. This is exactly what you need to start a lifelong career as a medical coder in the next year. This Bundle will help you get ready for the CPC® or CCS-P Exam while teaching you essential Medical Terminology & Anatomy for Medical Coders. You will receive 12 months of access to the Physician Based Medical Coding Course (PBC) and the Medical Terminology & Anatomy Course (MTA). Plus, we also include free access to the AAPC's CPC® Content. Also good for CCS-P and other physician based exams. If purchased separately, all of these Courses and bonuses normally cost $3,949. This is exactly what you need to start a lifelong career as a Facility/Hospital based Medical Coder in the next year. This Bundle will help you get ready for the COC® exam while teaching you essential Medical Terminology & Anatomy for Medical Coders. You will receive 12 months of access to the Facility Based Medical Coding Course (FBC) and the Medical Terminology & Anatomy Course (MTA). Plus, we also include free access to the AAPC's COC® Content. If purchased separately, all of these Courses and bonuses normally cost $4,149. We include section quizzes to ensure you've learned the material properly before moving on. If you hit a roadblock, simply revisit the online lessons to refresh your knowledge. Our Student Support Hub is where students, staff and instructors can meet virtually inside a private discussion area to ask questions or simply chat about lessons, topics or news. BHAT® is our exclusive “Bubble, Highlight and Annotate Technique”. The cave is an exclusive area with recordings of our marked up manuals so you can copy our notes and mark up your manuals just like ours. Our instructors frequently meet with many students on a live “group call” to answer all course and career questions. As a full course student, you’re invited to call in and ask questions during the live call. Remember that student call we mentioned in the other box? You will receive access to our archive of recorded student calls in case you need a quick answer that was previously addressed. Once you’ve passed the COC™ exam, you’ll need to maintain your certification every year by acquiring CEU credits. We’ve taken that worry off your shoulders by getting you started with many CEUs inside the included CCO Club. Starting July 1st, 2017, this course now includes access to a limited version of the CCO Club Basic Plan. The CCO Club is a place where medical coders, billers, auditors and practice managers can convene to discuss, learn and expand their knowledge. We provide CEUs, replays, transcripts and Answer Sheets of all our CCO Club Q&A Webinars, Student Q&A Webinars and Monthly Q&A Webinars. We're also continually adding unique case studies and bonuses to the membership. This Limited Basic plan grants the usual benefits to the CCO Club except for the extension of past purchases. 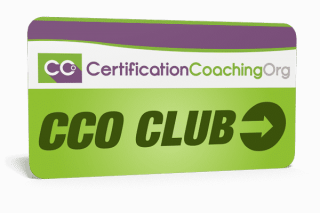 Our full courses now includes access to the CCO Club Basic Plan. The CCO Club is a place where medical coders, billers, auditors and practice managers can convene to discuss, learn and expand their knowledge. We provide CEUs, replays, transcripts and Answer Sheets of all our CCO Club Q&A Webinars, Student Q&A Webinars and Monthly Q&A Webinars. We're also continually adding unique lectures and bonuses to the membership. Are textbooks included with any of the Courses on this page? No, we do not provide textbooks since many students prefer to shop around for the best deal on their own books. If you want the textbook, please visit our bookstore. Is the cost of the AAPC's exams included with the Blitzes? No. You will need to purchase the AAPC exams directly from the AAPC website.